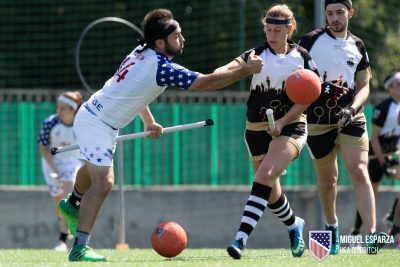 For Boston University alumni Max Havlin and Lulu Xu, fantasy became reality after winning gold for the United States at the 2018 International Quidditch Association World Cup in Florence, Italy this past weekend. 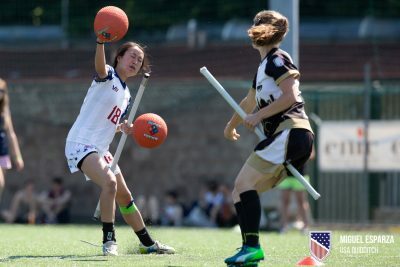 In the eight-year history of the IQA World Cup, the U.S. team won the title in the first two tournaments in 2012 and 2014, but was defeated by Australia in the 2016 final. During its 2018 run, the team went undefeated and reclaimed the title against Belgium. Modified from the high-flying sport from J.K. Rowling’s magical Harry Potter series, quidditch has been growing into a more grounded game since since 2005. Five years later, the national governing body of U.S. Quidditch was formed and now oversees over 4,000 players. The USNT sent an applicant pool of 145 potential players through scouting reports, in-person training camps and tryouts to make the 25-player roster. For Havlin, 26, and Xu, 25, interest in the sport stemmed from their love of Harry Potter, but quickly translated to appreciation for its athleticism. Both described first playing competitive quidditch on the BU Quidditch club team before joining Quidditch Club Boston, a community team based out of Somerville, after graduation. In 2016, QCB claimed the title of national champions after a 29-1 season. Havlin, who serves as a captain of QCB, also spoke to maintaining the quidditch community in Greater Boston. Despite starting as chasers — offensive players who produce points by putting a volleyball called a “quaffle” through one of three upright goals — the two players found success in the more defensive role of beaters. While the witches and wizards of Harry Potter used 150-pound, quasi-sentient iron orbs for bludgers, the beaters of today use dodgeballs to “knock out” players, meaning they are out of play until they touch their own goals. Xu, meanwhile, laughed about the transition, claiming her hands were too small to handle the quaffle. Quidditch is a mixed-gender sport that enforces a “gender maximum rule” stating that no more than four players identifying as the same gender on the field for the same team. USQ’s advocacy and awareness branch, Title 9 ¾, states that the ruling is intended to promote “respect and value” for players’ abilities regardless of gender. Xu, who made her international debut in this year’s tournament, claimed that in her first years playing, opposing teams used larger players in an attempt to overpower her, but that she enjoyed the challenge.